Granny / Beverly Elliott #3: "Although I'm old and grey, happy times are here to stay." ~She's one of kind, a show grandmother, part of Prince Charming's War Council, she also has a pretty good sense of humour which ticks her granddaughter Ruby/Red Riding Hood off. She owns Granny's Inn and Granny's Cafe. She also made Emma's baby blanket in the Fairy Tale Land! What more is inside of that Inn or her Cafe?! I noticed Marco was hugging Granny and Blue. Title suggestion: "Although I'm old and grey, happy times are here to stay." Updated the title, thanks for the suggestion. 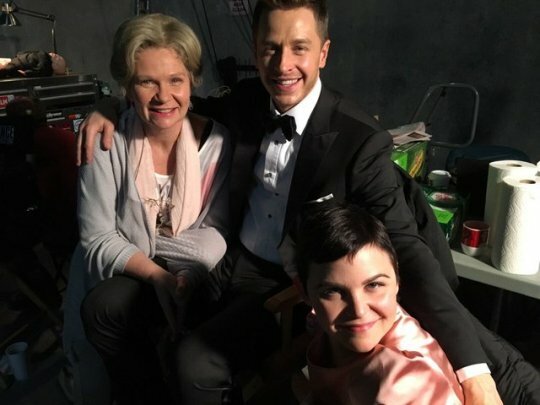 BTS pic of her with the Charmings. Kinda fitting that the last shot of all the mains was at Granny's. I have a feeling there will be a lot of extended family dinners there.